Remarkable achievement of ancient civilizations is the Great Silk Road. And the non-casual. For the first time in the history of mankind for a thousand years, a vast territory from the Mediterranean Sea to the Pacific Ocean, from the West to the East, he put together a lot of countries and people, their material, art and spiritual culture. It parallels the first-opening of the Great Silk Road, and the second – time attack information. This contributed to intercultural kontaktamstat regular and more frequent, leading to activation of kommunikatsiyopredelennyh individov.Eto societies and allows you to see a variety of people who took part in this exchange of ideas and turnover, as well as to identify trends in international relations in the future. Along the Silk Road have spread different ideological beliefs, formed the main centers of the world religions. The relationship between the different religions and beliefs, which took place on the Silk Road, influenced the course of historical events that have affected the religious beliefs of the people. The Silk Road cities of the East are, the former center of the way, Samarkand, Tashkent, Bukhara, Khiva, Tehran and Baku. But time does not stand still. Kalyan Minaret in Bukhara, who was one of the main building in the city, gave primacy television tower. Traces of camels and caravans going through the deserted and hot desert dunes gave way to high-speed bus and rail routes. In 1988, the adoption by the UNESCO proektaMezhdunarodnoy “Integrated research of the Silk Road – the path of dialogue,” there has been a study of the history of the Silk Road, as well as discuss the current development of cultural relations between East and West, as well as expected to improve relations of the peoples living on the Eurasian continent. And in 1993, the UN General Assembly decided to revive the Great Silk Road, to resume international cooperation in the field of diplomacy, culture, science, trade, and tourism. To date, the leading role in the resumption of the great trade route belongs to the World Tourism Organization (WTO), it is the author of the project “Tourism on the Silk Road.” It involves travel companies from 19 countries belonging to the region today, the Silk Road, it is Uzbekistan, Kyrgyzstan, Turkmenistan, Kazakhstan, Tajikistan, Iran, Georgia, Armenia, Azerbaijan, China, Pakistan, Turkey, Japan, India, etc. For example, in Uzbekistan, you have more than four thousand works of antiquity, the thousand-year history. Here are a World Heritage Site, the Mausoleum of Ismail Samani Kalyan Minaret in Bukhara, built in the X and XII centuries, Registan Square in Samarkand, Buddhist temples and Fayaztepa Dalverzintepe and many others. Listed by UNESCO as a World value centers of the Silk Road, Samarkand, Bukhara, Karshi, Ichan-Kala in Khiva. And also in the list of World Heritage Sites including the territory of ancient Merv in Turkmenistan, Arab istorikinazvali her “father of Cities”, the mausoleum of Khoja Ahmed Yasawi in Turkestan, staged at the time of Amir Temur, monuments in Iran – the ruins of the ancient city of Elam, in the open Choga-Zembil, complex Meydan Imam in the ancient city of Isfahan, known since ancient authors mound Takhte-Suleiman the temple Zoroastrian goddess Anahit. Route of the Silk Road affected the South Caucasus – Armenia, Georgia and Azerbaijan. For this reason, the historical monuments of these countries are included in the UNESCO World Heritage List, it’s cathedrals and monasteries of Etchmiadzin in Armenia Zvartnots temple, cathedral Sveti Tskhoveli and Bagrati Gelati monastery ensemble in Georgia, an ancient city ensemble with Shirvanshakh Palace and Maiden Tower in Baku. All of the above sites are a favorite place for tourists. Today we can take a number of Great Silk Road trips on. 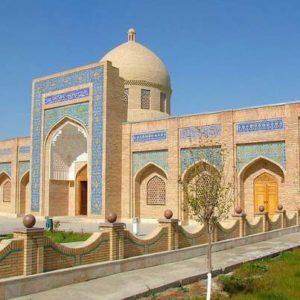 Great Silk Road” offers a look at the chain of Kazakhstan – Uzbekistan – Turkmenistan – Iran. And the journey “for Central Asia,” the speaker called. Today, the Great Silk Road is not only roads and cities he was rounding. It includes a variety of natural landscapes in the form of mountain peaks and alpine meadows, Tien-Shan and Pamir for lovers of adventure tourism, sand pustynKarakum and Kyzyl Kum, Issyk-Kul and relict pine forests Borovoy, Chimgan Bildersayskih and ski resorts, turquoise waters of the deep lake , walnut groves in the tract Arslanbob etc. Recently, transport relations of Uzbekistan, Kazakhstan, Kyrgyzstan and Turkmenistan have new outlets in China, Iran and Turkey via Georgia. Embark on a journey along the Silk Road, this tour will give you a lot of positive experiences and knowledge about the achievements of human civilization.